The first true postcards had no space for messages. The photograph took up the entire front of the card, while the back of the card was blank. The address was meant to stand alone there, as it would on the front of an envelope, so that the postman wouldn’t get confused and mis-deliver it. Collectors refer to these as “undivided back” cards. 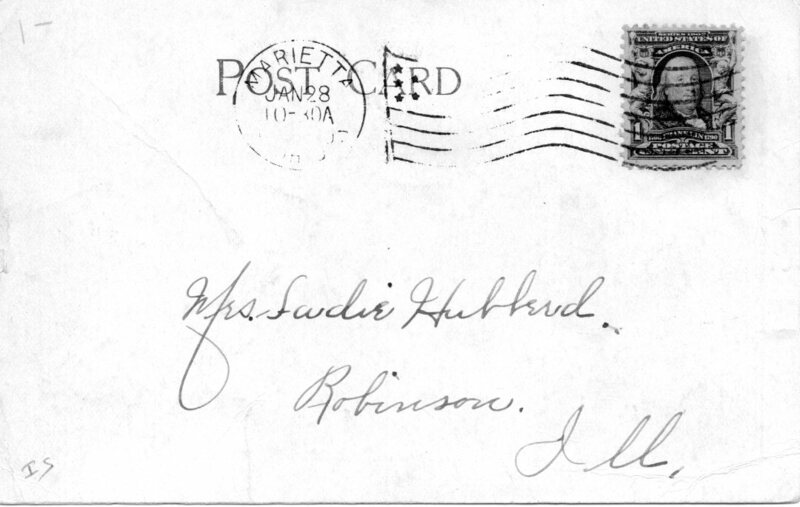 The postmark is hard to read, but the US government allowed printers to begin using the words “Post Card” on the back of cards after December 1901. Cards with divided backs — with space for a message on the left-hand side of the card — came into use in Europe almost immediately, but didn’t start to be used in America until after 1907. I like that the address on this card is so simple: “Mrs. Sadie Hubberd, Robinson, Ill.” No need for a street number. Zip codes didn’t become necessary until 1944, and then only in large cities. These undivided back cards were intended to be mailed, then tucked into an album and treasured. Even so, senders managed to squeeze a message in where they could. This one reads, “Still living will write in a day or two,” but there is no signature. I hope Sadie understood who was writing her. 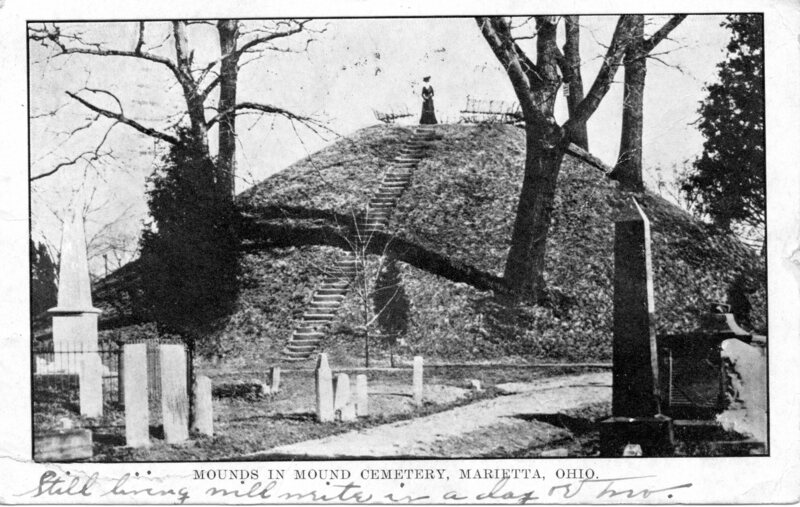 The photo on the front of this card shows the Conus mound in Mound Cemetery, Marietta, Ohio. Atop it stands a woman in a long dress and a proper hat. She’s hard to make out in the photo, but she gives a good indication of the size of the mound. As the first settlement in the Northwest Territory, Marietta has one of the oldest pioneer graveyards west of the Appalachian Mountains. General Rufus Putnam, founder of the settlement, donated land surrounding this large Native American mound to be a graveyard in January 1801. Revolutionary War veteran Robert Taylor was buried there in October. In fact, the cemetery claims to have the highest concentration of Revolutionary War veterans in the country. The 30-foot-tall Conus mound was built by the Hopewell people between 800 B.C. and 700 A.D. Inside it lie their chiefs, who were laid to rest, then covered over with a layer of dirt carried from a nearby pit one basketful at a time. Each layer of chiefs were laid above their ancestors until the mound reached its current height. The mound can still be climbed using the staircase you see in the picture. This entry was posted in Cemetery postcard and tagged Mound Cemetery, Ohio cemeteries. Bookmark the permalink.